Wishing that your users get what they want easily? You could always help them with this search module. This module facilitates the search of products in j2store. When the name of the product is typed in this search box, the products that have a part or whole of the keywords typed will get displayed. I already have the joomla search box. Why would I add this module? This search box serves more or less like the joomla search box but with few differences. While the joomla search box is capable of searching j2store articles, there is one exception for its functionalities. Joomla search box will not be able to search products if products list view is used to display the products but it is capable of finding those that are displayed using article or category blog layout. Whereas,J2store search box is capable of picking products that are displayed using products list view as well, thus overcoming the default joomla search box's limitation. J2Store search box will search the product's title, SKU, Description. Product search module can be downloaded from our site and installed using the default joomla installer. 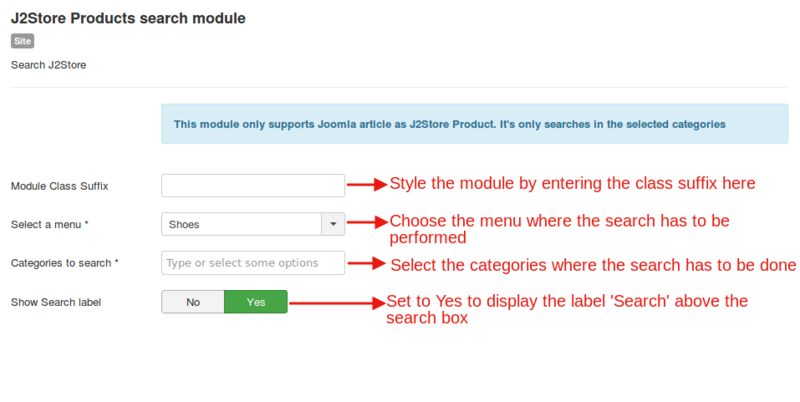 Go to Extensions->Modules->J2Store Products search module . Module class suffix Enter the class suffix if you wish to style the module. Select a menu Select the menu items whose contents have to be searched when a key word has been specified at the search box. Categories to search Specify the categories where the search has to be done for the keywords typed in the search box. Show Search label Set this to Yes if you wish to display the label Search on top of the search box. If you use other catalog sources such as K2, Zoo, Sobipro, please use native search functions of those extensions. This module will support ONLY products which are Joomla articles. Please avoid requesting support for other CCKs as all the CCKs have excellent search functions and features.